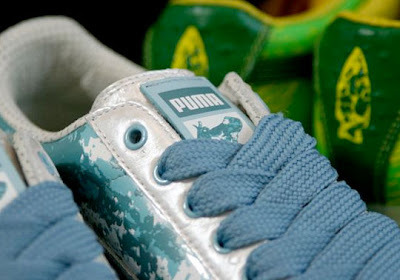 SPECTREOUTREACH.com: Spectre+ JUNK = Puma Clydes "Frog Pack". Spectre+ JUNK = Puma Clydes "Frog Pack". Recently I airborne *yet again* to Junk office at Jaya One to collect my Froggie aka Puma Clydes Frog Pack. Truly shocking as I look with awe, those " oestrich leather uppers and vibrant camouflage patterns" . (Mine is the Blue version) ^^! AWESOME. Another collection for Spec!